Why have you come by to read this blog post today? 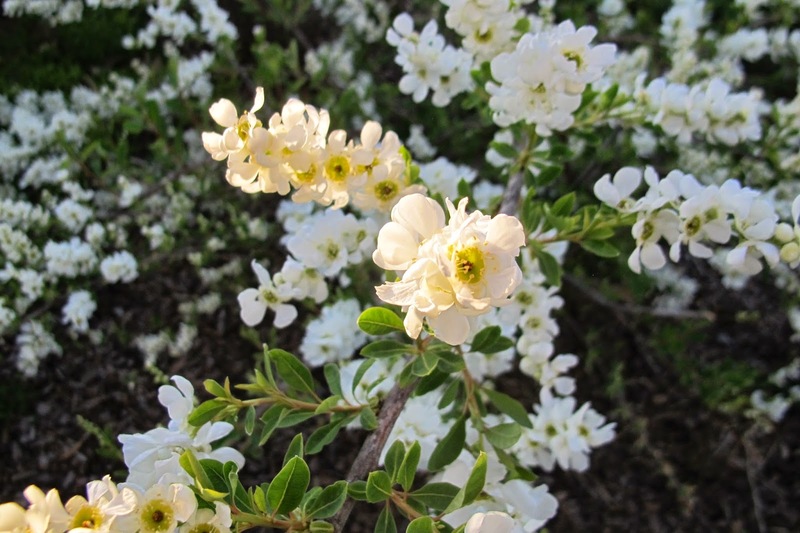 Perhaps you are here to find out about some new plant that I'm all excited about, like pearl bush, Exochorda racemosa, which is blooming in my garden and has never looked better than this spring? Or maybe you were hoping the garden fairies posted something? They usually have something to say and often explain how things happen in a garden in ways I simply cannot. Some of you might have come by looking for Dr. Hortfreud or some other character, like the long lost Hortense Hoelove. Geez, she hasn't posted any questions/answers for ages. Really, she's lazy and would spend all her time sitting in the garden eating bonbons if she thought she could get away with it. Silly Hortense. Or perhaps you are here by accident? Whatever your reason for coming by, thank you. It's a pleasure, always, to see that people read what I write, and sometimes even comment. I come by because of your humor, and to learn about plants. Your blog is my absolute fave, Carol. It's the last one I read, because I save the best til last! Thanks for the pleasure & delight you provide as you share your garden adventures with us. Good Morning, I got started reading your blog because I saw a link to a Bloom Day post last summer. I continue to read because of the humor and the stories from the fairies. I also see traffic from your site when I link a bloom day post from your post to my bloom day post. Indiana is far enough away that I don't try to plant the same things as you do, (I'm near Washington DC.) but I enjoy reading about what you're up to. I enjoy your humorous look at the garden. So many things in the garden are difficult, such as the work to keep it nice, losing a beloved plant or some other calamity. The turn of the word that you use make these things seem not so unbearable. Besides you are more entertaining than most tv programs. I also like to see how far along your garden is compared to mine which is just a little south of your garden. I come because of your humor, Carol, and the wise advice you and your cohorts give to help me de-stress when I get overwhelmed with everything that needs to be done. I've been wondering what Hortense has been up to; I wouldn't mind sitting and chatting with her, especially if she'll share some of those bonbons.